Achtung! Cthulhu is a well-received pen-and-paper RPG title. Now a collaboration of the original publisher of Achtung! Cthulhu, Modiphius Entertainment, Ripstone and Auroch Digital has led to the development of Achtung! 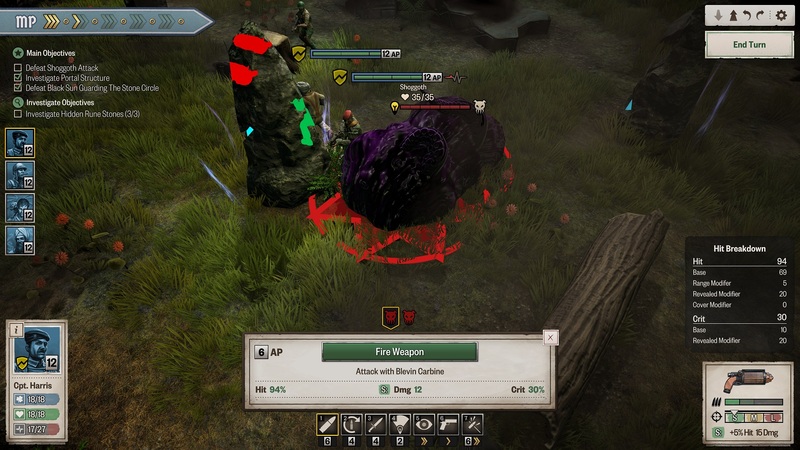 Cthulhu Tactics, a digital turn-based version of the original pen-and-paper RPG. The story revolves around a band of heroes that is stuck behind enemy lines in the shadows of World War II. Their enemies are not only the Nazi soldiers, but also an inhuman species originating from the Cthulhu Mythos. They need to fight a desperate battle against the Nazis and their mysterious inhuman allies as they fight their way through tactical battles. The story of Achtung! Cthulhu Tactics is set on the battlefield right in the middle of World War II. You’ll take control of a team of heroes that is trapped behind enemy lines. They have to fight their way through all the Nazi troops but the Nazis are not alone! Alien-like creatures will also be on your path. These creatures are based on the Cthulhu Mythos and it seems the Nazis have something to do with the surfacing of these monsters. Your team needs to find out what the Nazis are up to. Everything is told during the loading screens after starting a mission. You’ll get a mission briefing voiced by your commander. This mission briefing is written in a telegram. Mostly this briefing tells you what you can expect in the next level, which enemies you’ll encounter and the type of area you’ll be in. Achtung! 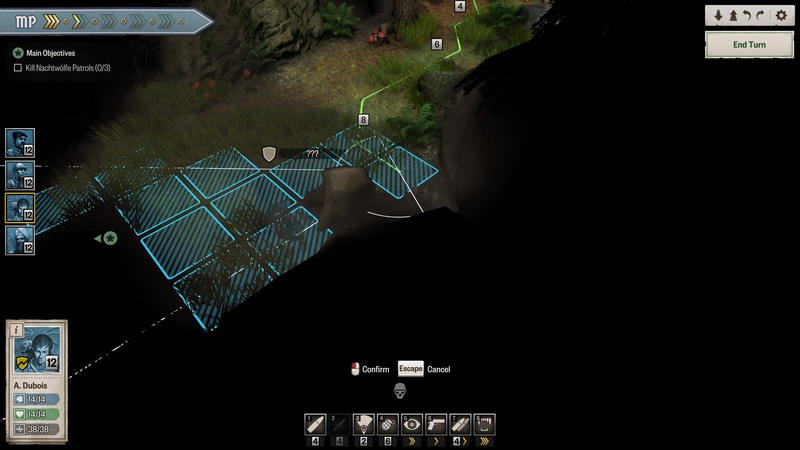 Cthulhu Tactics uses an isometric view perspective. This view fits the gameplay perfectly because you can see everything your team can see. This encourages you to anticipate your enemies’ moves and from where they could come from. The graphics of this game are detailed enough to show enough characteristics to recognize your own team and your enemies’ faction by clothing alone. The red Nazi band on the arms of the Nazi soldiers is very easy to recognize. Your team members all have their own field of view, formed as a cone. 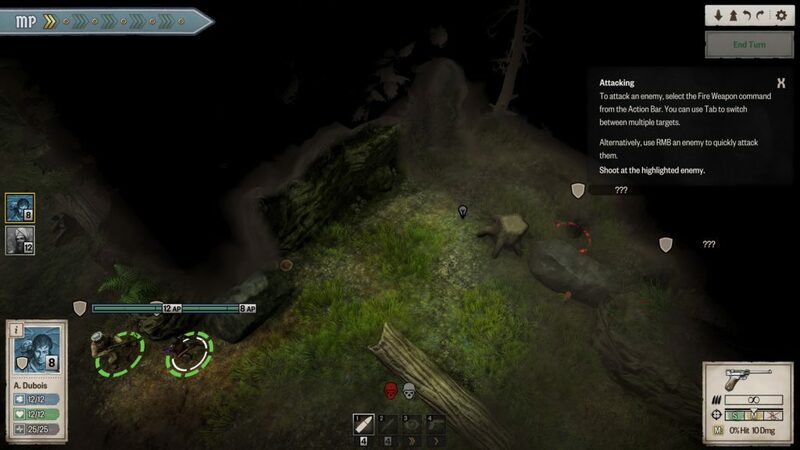 Everything inside this cone will be fully visible and enemy units will be revealed with a health bar and unit type name. A small area around the cone will still be visible but a bit darker. You can see enemies inside this area but if you haven’t spotted them yet, you won’t see what type of unit it is and will be shown somewhat like a ghost-like unit. The area around the darker area will be fully black and nothing will be revealed in this area. The music used in Achtung! Cthulhu Tactics totally fits the setting. When in the menus, you’ll hear songs that sound like they’re played with an old-school gramophone. The quality of the music indicates that the music is from around the 40s, exactly the period in which the game takes place. When starting a mission, you’ll be briefed by your commander. He’ll tell you what your objectives are in the upcoming area and what you can expect to go up against. Enemy units consisting of Nazi troops will talk and scold in German when hit or moving to their next position. Your team uses the English language to communicate. When in combat, a thrilling music will play while choosing your next moves. When your team kills the last enemy in combat, the music will stop the moment you execute the last shot and combat ends. This happens before the shot is fired so it will give away that the shot will kill your last enemy. Achtung! 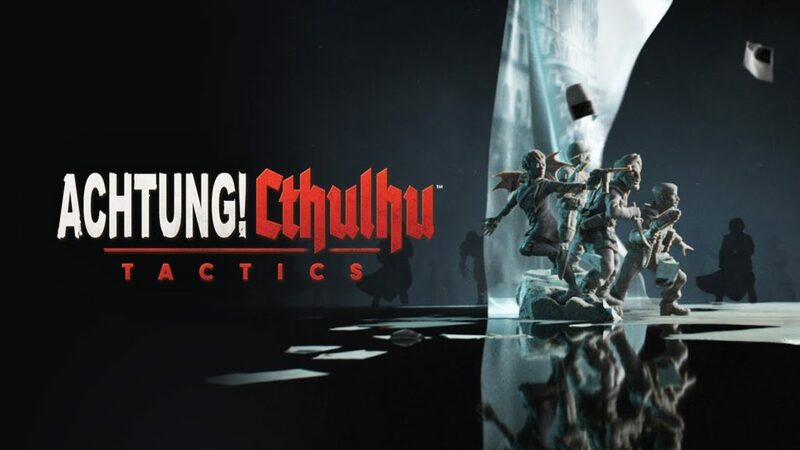 Cthulhu Tactics is a turn-based strategy RPG that lets you fight against Nazis and their otherworldly allies. At first you’ll only encounter Nazi soldiers but after a while, you will also encounter mysterious creatures from the Cthulhu Mythos. The first creature you’ll encounter will be Shoggoth, a purple blob-like creature that moves close to you to hit you with its tentacles. They’re slow and can be killed easily before getting hurt as they only move two spaces each turn. Further on, you will go up against more of these mysterious creatures. 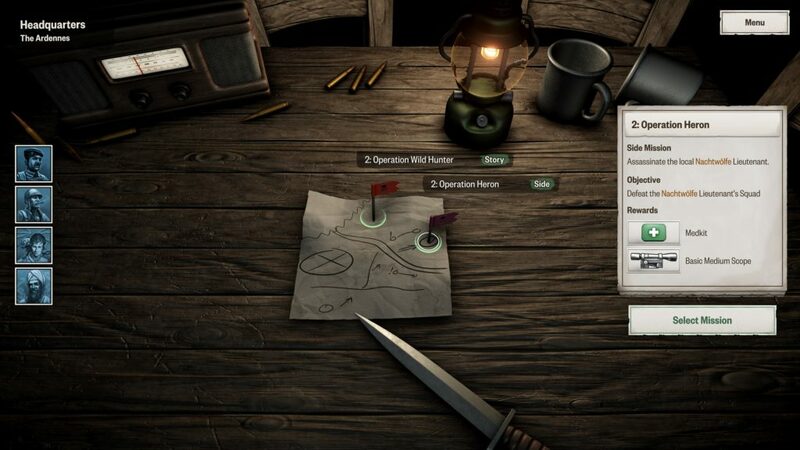 When you start a level, you need to navigate your way through to your objectives. When not in combat, you can freely move your team by clicking somewhere in the visible area. When you get near enemies, combat will start. Your enemies will have the first move, with which they’ll only betray their positions. After that, your move will start. Each team member has 12 action points to move and shoot at enemies and a certain amount of momentum points that can be spent for using skills and getting just that bit further than you would get with your maximum action points. The further you want to move your character, the more action points are needed to get there. When your team is in cover, they’ll be harder to hit by your opponents. When your enemies are in the line of sight of your team, you’ll have a higher chance to land a hit on them and they have a lower chance to hit your team as well. The amount of protection given by your cover is indicated by shields and broken shields. With rifles and shotguns, shots will cost 6 action points. Some characters have the possibility to use a pistol as their main gun with a lower damage output. Shots with this weapon will only cost 4 action points, meaning you’ll have three shots if you don’t need to move that character. damage threshold. Weapon mods include scope attachments, bigger magazines and improvements like better stocks. Equipment includes grenades, flares, body armour and attribute-increasing items. For example, a letter from the home front will increase your character’s willpower. After each completed level, you’ll earn party experience. When your party levels up, you’ll earn skill points. You’ll gradually need more skill points to buy new skills but you also earn more skill points with each next level. Every party member gets his own skill points. So you can customize each character the way you want. Skill points can be invested to increase your hit chance and critical hit chance or acquire new skills to use on the battlefield and increase your general stats. Achtung! Cthulhu Tactics is a surprisingly fun tactical turn-based game that really rewards good tactical thinking. If you increase your luck, it will be even easier to kill a big group of enemies with only the four of your team. Getting critical hits rewards you with momentum that can be used for extra secondary weapon shots and the usage of skills. Thinking about your position and using the line of sight of your team is important but is very rewarding if you execute this correctly. If you like turn-based games, shooting s and killing inhuman creatures, then this game is definitely worth a try! Lovecraft’s Untold Stories – Soon to be released!